Today’s post will dabble into my childhood. Pretty uninteresting stuff to some, but the neat thing about blogging is that it allows you to not only allow the world to see your writing, but also allows you an avenue to focus your own thoughts via text. That being said I’ll try to make this post as enlightening as possible to those who know me. For those of you who don’t know; who were either remarkably high on the social ladder, lived under a rock in the 1990’s, or were not around back then, the following is Data from Star Trek: The Next Generation. Not necessarily the best Star Trek series (HINT: Deep Space Nine), but definitely the most accessible to the modern audience. It broke all kinds of ratings records and stuff. 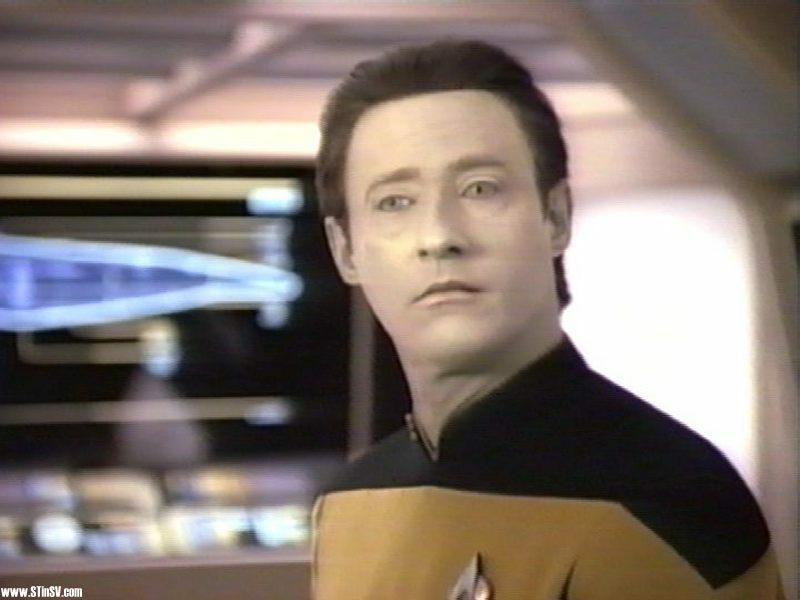 Data was the science officer, and the second most well known character besides Captain Picard. Say hello. Oh, did I also mention he is an android. Completely emotionless, but with an insatiable but unattainable desire to be human and display human emotion. Kind of like me in my middle school/early high school years. Quiet. Emotionless. I got picked on a ton. Is it any wonder I could relate with and envy this character more than any other “human” on that show. As I began to watch the show in my early preteen years, I began to subconsciously emulate him. I leaned ridiculously big words and began to take insults with no more emotion than my android “friend.” It was a way of coping to the dog-eat-dog world we as a society toss our children into come school age. It allowed me to keep even tempered and fall back on the one thing I might have, intelligence. And… I think that Data really made me the even-tempered, highly logical person that I am today, despite the fact that I’ve finally managed to push through many of the social barriers that were impossible to break as a child. Even as I have achieved some level of popularity in my college years, I can still see myself taking some cues from the character I emulated as a child. So… I suppose that beyond God and my family and the few people who I can truly call my friends, Data helped me develop as a human being. Ironically, they actually did an episode about a child who used an android persona to cope with difficult times. It’s called “Hero Worship.” It’s on Netflix, so I highly recommend you check it out. Now. If you intend to throw the word NERD at me as an insult for what I’ve just written… I feel sorry for you.